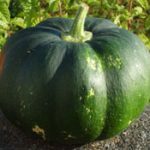 Pumpkins and Squashes grow best in warm sunny conditions. Well drained soils are essential. In spring make planting holes which are a spade’s width and depth. Fill the holes with well-rotted manure or garden compost and replace the soil to form a mound over each hole. There will be no need to add any fertiliser at the sowing stage. Space the mounds at least 4 metres apart. Sow seed in small pots, for eventually transplanting outside. Sow late April to late May. Sow one seed in each 7cm plastic pot in a John Innes No 1 type potting compost. Sow 2cm deep. Keep at 18C degrees. and in good light to maintain growth. When all frosts are over, harden the plants off over a few days. Water the mounds and transplant one plant into the top of each mound. Mulch all round each plant. Keep well watered. Take care not to wet the leaves in strong sunlight. Early morning is a good time for watering. Give organic liquid feed as required when the fruits start to enlargen. 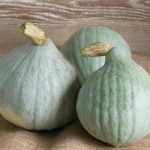 Trailing varieties of Squashes and Pumpkins produce many side shoots. These need to have their leading shoots snipped off, leaving 60cm from the main stem. Spread the side shoots evenly around the plant. 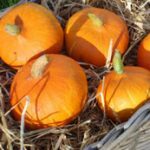 Pumpkins and Squashes that mature in September should be prevented from resting on damp soil to avoid rotting of the fruit. Straw can be very carefully slid under each fruit. 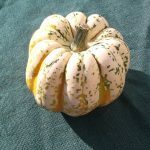 Winter Squashes and Pumpkins need to develop a hard outer skin. 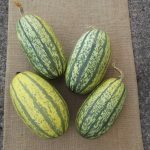 To help with this ripening, cut off any yellowing leaves to let in sunlight. Harvest Cut with a knife before the first frost. Make the cut with a long piece of the stem or ‘handle’ to delay rotting. Leave in a dry sunny place such as a greenhouse for at least 4 days. In poor weather bring indoors to a sunny windowsill for further ‘curing’. For storing, the skin must be perfect and undamaged. Store in a cool (but frost-free), dry and well-ventilated place. Fruits can be placed on racks or hung in nets not touching each other. Storage can be from 2 to 6 months depending on the variety. 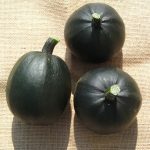 Courgettes are summer squashes and are eaten young before developing a hard skin. They will not store. They need well drained fertile soil. the ground should be well turned over and some garden compost should be dug in in early spring. Sow seed in 7cm pots to be transplanted outside. Sow mid to late April. Sow in John Innes No 1 type potting compost, 2cm deep, and keep at 15C degrees. Harden off ready for planting out after the last frost. Plant out at 1metre apart. Mulch around the plants. water gently in the early morning, not in full sun. once the plants are flowering, give a seaweed-based organic feed if not growing vigorously. Feed again later in summer if growth slows down. 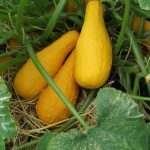 If courgettes are sown early in the year, or it is a cold season, the female flowers may need hand pollination. female flowers have a very small fruit behind the flower. Pick a male flower (no fruit behind) and push it into the centre of the female flower. Harvest Cut with a knife when young and small for good flavour. they are best at 10 to 15cm long. They need to be cut almost daily to make sure that the plant continues producing. all must be harvested before the first frost.